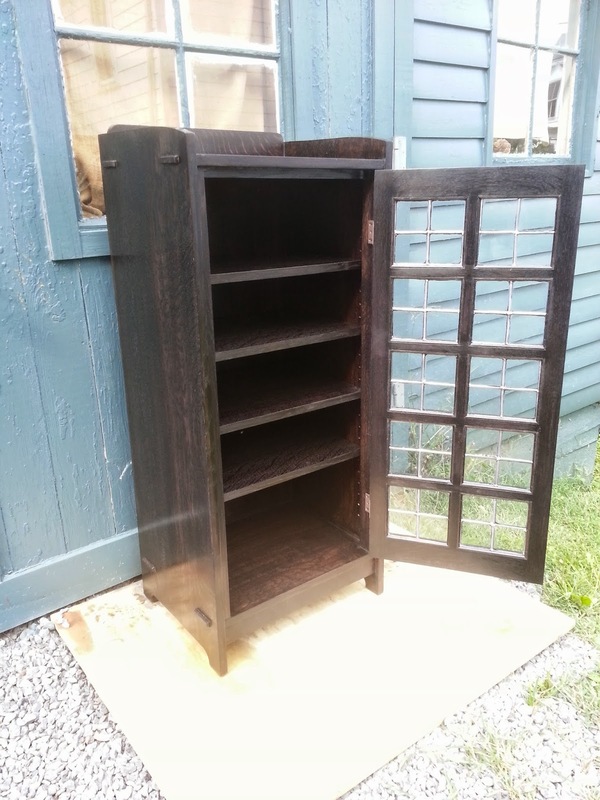 Recently I was commissioned by a customer to build a reproduction of a Stickley music cabinet no.70, which was first produced by the Gustav Stickley Furniture Company around the turn of the 20th century. The purpose of the cabinet was to store sheet music next to a piano and the one I was commissioned to make would be used exactly for that purpose. 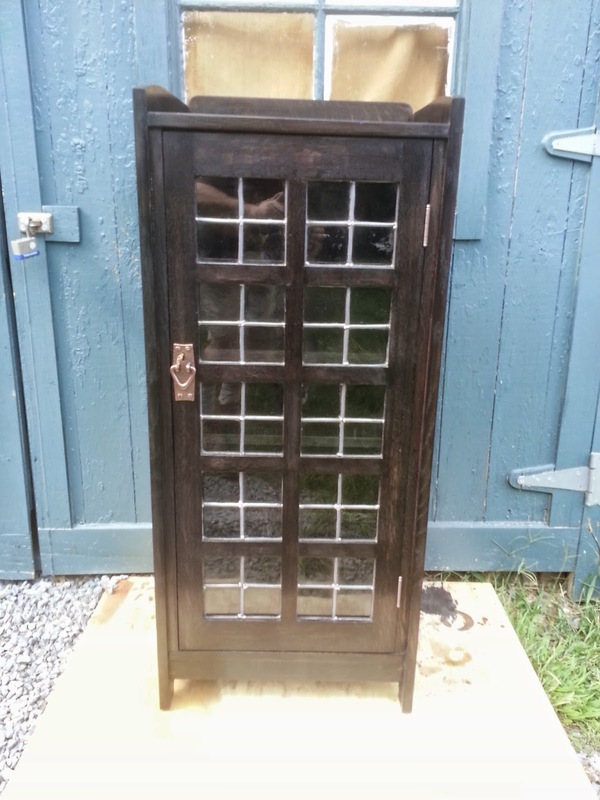 The cabinet was made in many forms, sometimes with a solid panel front and other times with 10 glass panes. The one that the customer liked the best was probably not completely in it's original form. 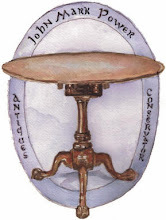 The surface had been ebonized and the lights, which were probably originally amber glass, had been replaced by panels comprised of four panes divided by lead came, the same material used in stained glass windows. 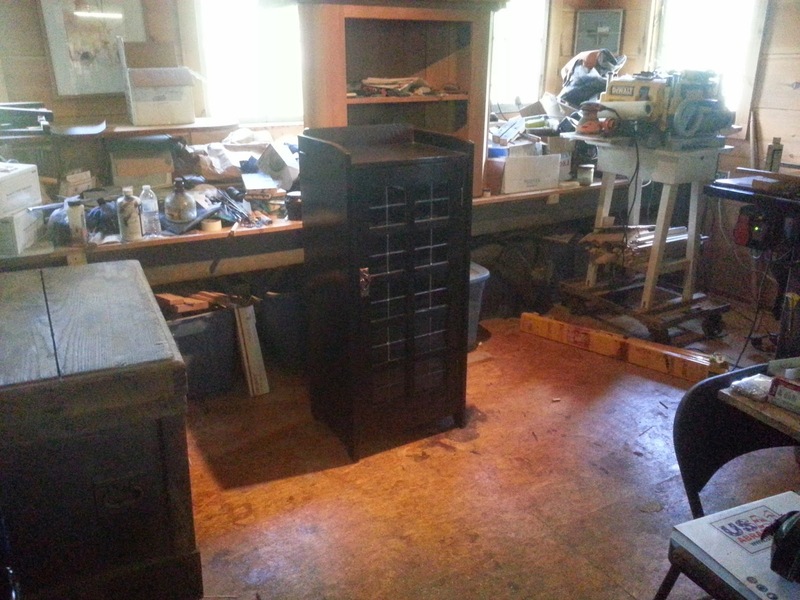 Below is a photo of the cabinet that the customer had seen. In addition to this, Mr. Lang produced a rendering of his cabinet in Sketchup, a design software I use to design furniture. Using his original sketches, I made the necessary changes to the design to suit the customers needs and presented the drawings below. At the time we were unsure if the individual panes would be subdivided like they were in the photo, so I did not draw this. 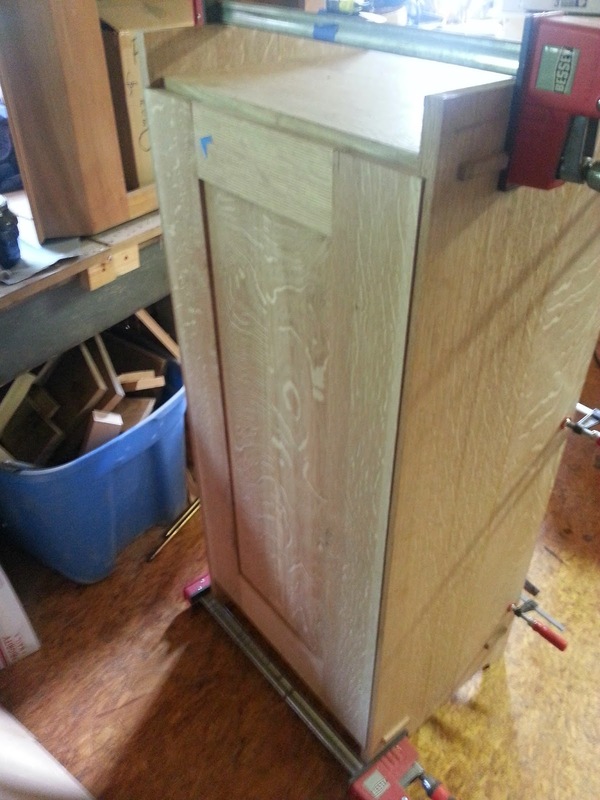 Besides the difference in cosmetics, I also chose a simpler method of joinery on the door than Mr. Lang designed for his cabinet. Hats off to him for his mitred mullions and muntins! 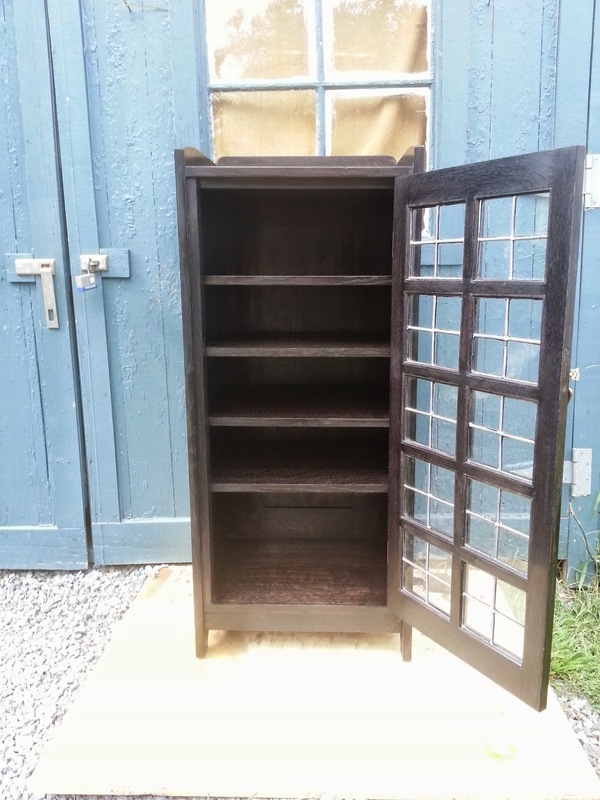 The first step in building the cabinet was the selection of material. Stickley used Quartersawn White Oak in the majority of his work and this was requested by the customer so I bought some beautiful wood from my friend Rick at Herbine Hardwoods (http://www.herbinehardwood.com/). 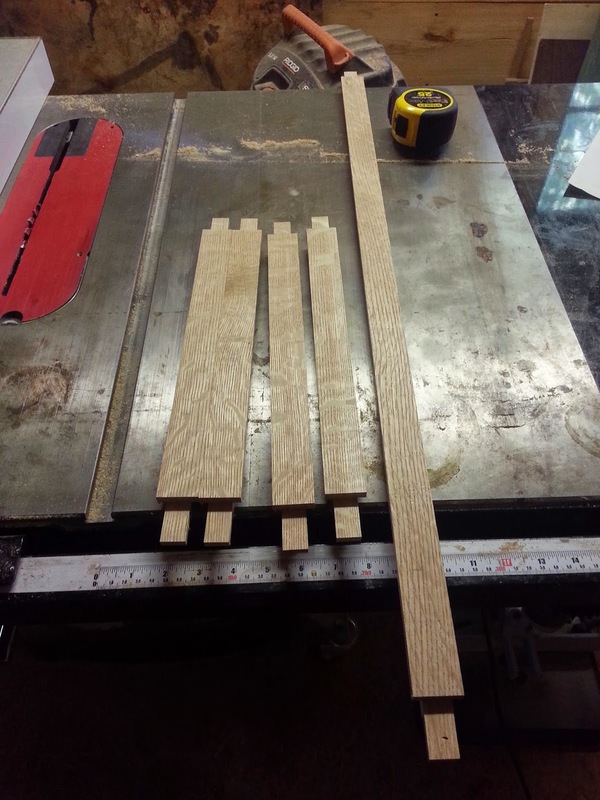 After looking over the wood, I figured out what boards would be used for which part and cross cut the boards a little over size. 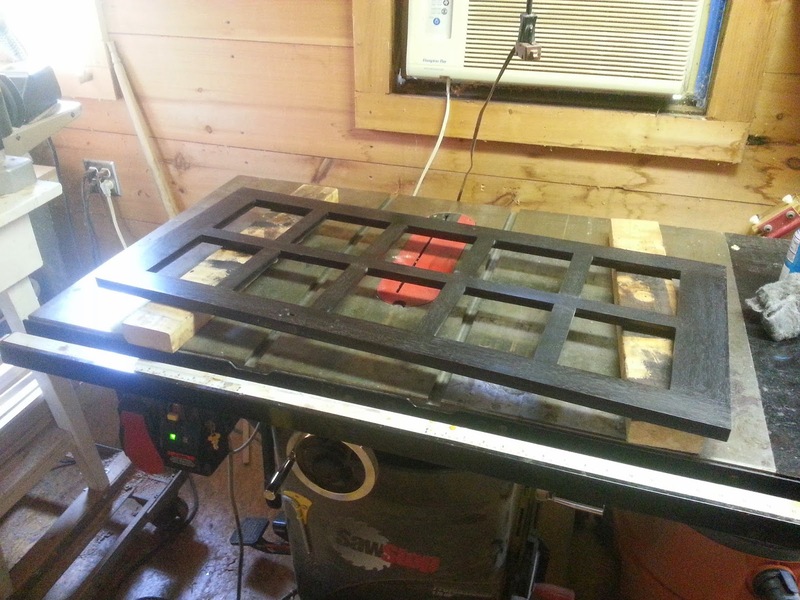 This helped me to conceptualize each component and also made it easier to work with the wood in my confined shop! Below is the stack of lumber after cross cutting. 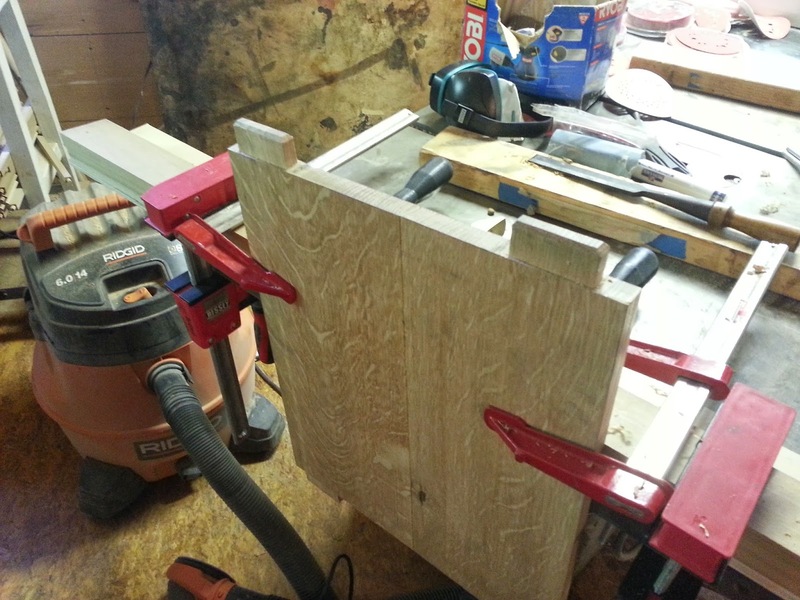 After milling the lumber to the required thickness, the next step was to glue up the large panels. 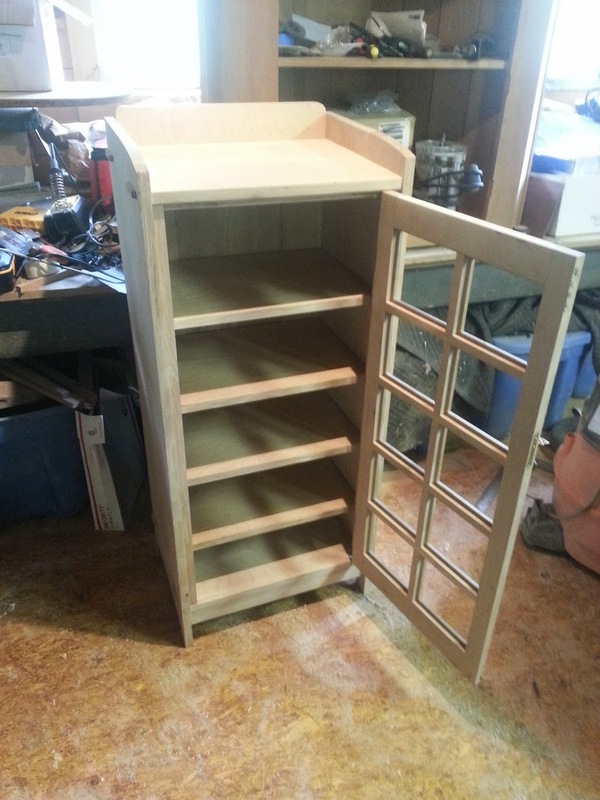 Below are photos of the side panels, the back panel, the top and bottom panel, and the shelves being glued. One of the great functions of Sketchup is the ability to create real templates from drawings in the program. 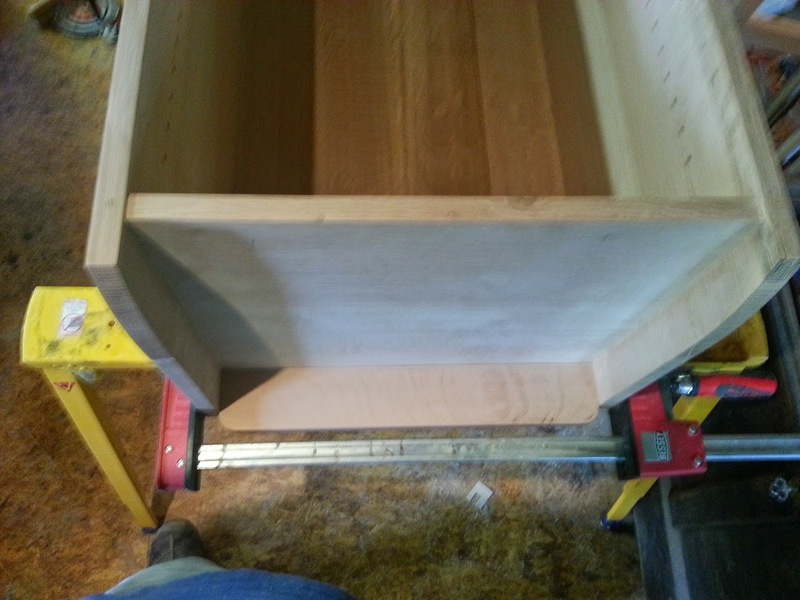 I needed to transfer the profiles for the top and bottom edge of the side panels as well as the mortise locations for the mortises that connect the side panels to the top and bottom. The mortises were the same in length so I combined the two sets into one with the most important parts being the size of the mortises and the distance from the top edge and the bottom edge. By resizing the face of one of the side panels in the drawing, I was able to create a template that satisfied all of my requirements. Here is an image of that template in the program. Using add on software for the Sketchup program, I was able to create printouts of this on letter sized paper. Because the template is larger than a letter size sheet of paper, the program adds registration marks to the template to ease with lining up the image. I printed it out on transparent full sheet labels with adhesive on one side and attached the sheets to a piece of MDF (medium density fiberboard) that would serve as the template. 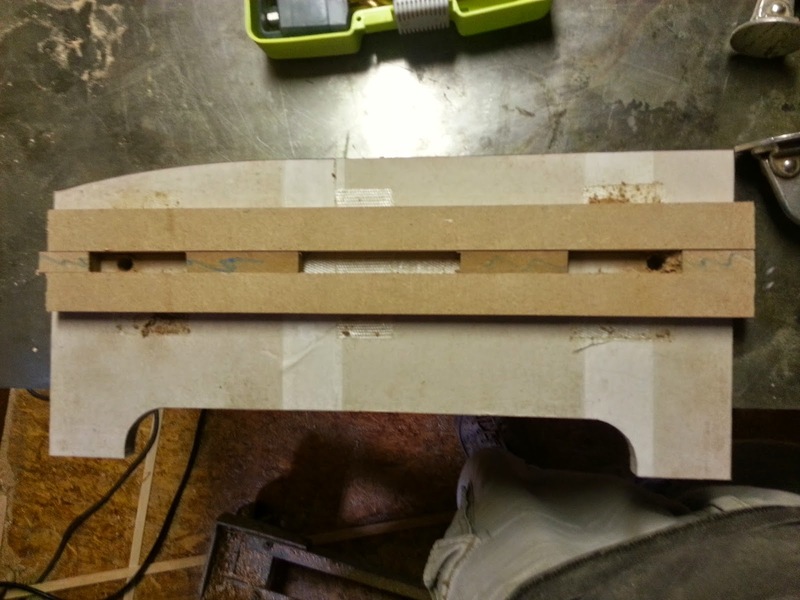 In the photo below you can see the piece of MDF with the template adhered to it. After the labels were adhered, I cut along the outside lines and then took an idea from Bob Lang to build around the mortise locations with wood blocks adhered with double stick tape. 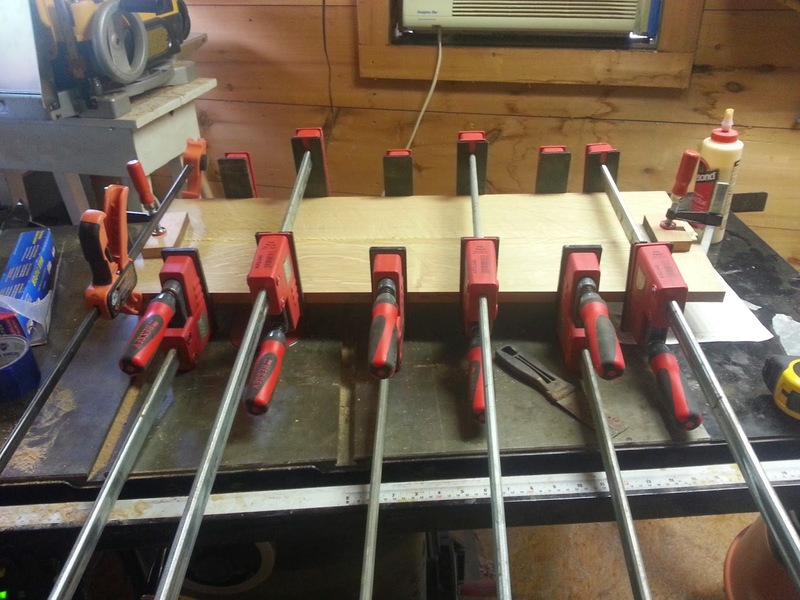 These would serve as a guide for the router when creating the mortises in the template. 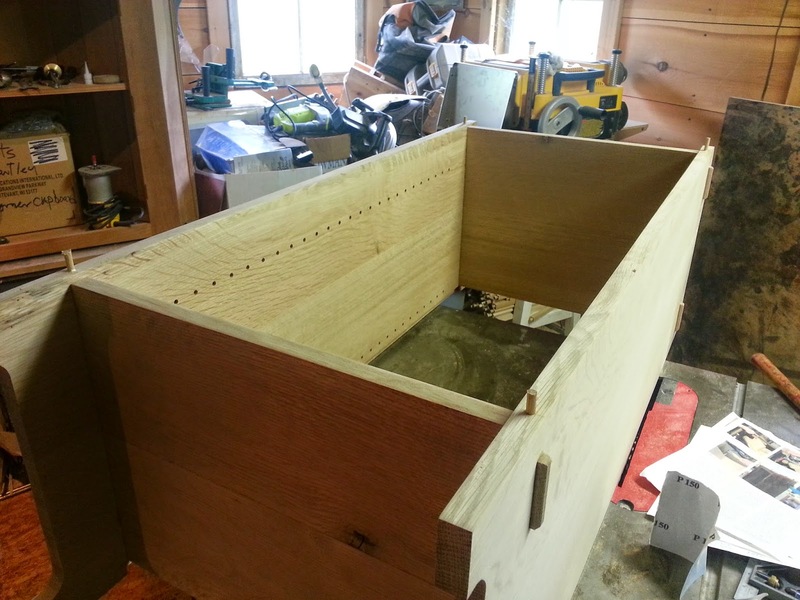 The template can be seen with the guides in place and starter holes drilled in the mortise locations. 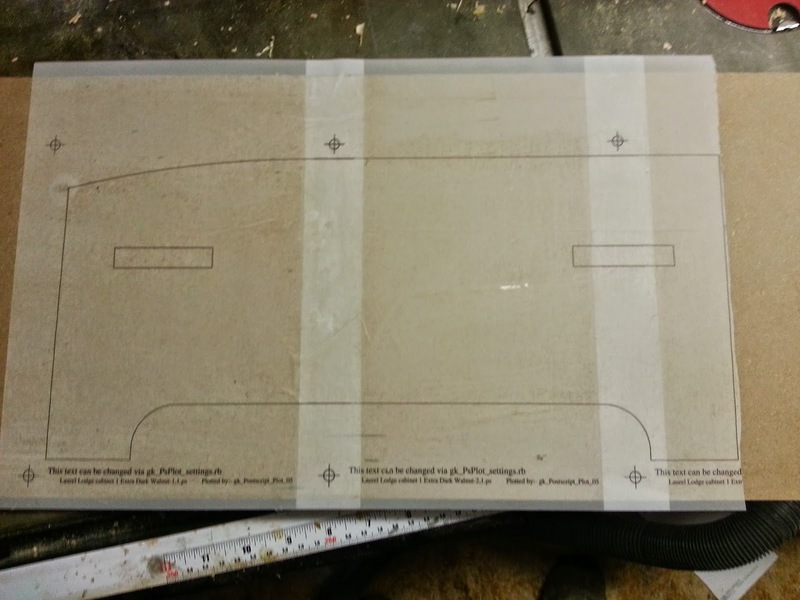 Because of the bit I had to use I had to do the routing with the template upside down, as seen below. 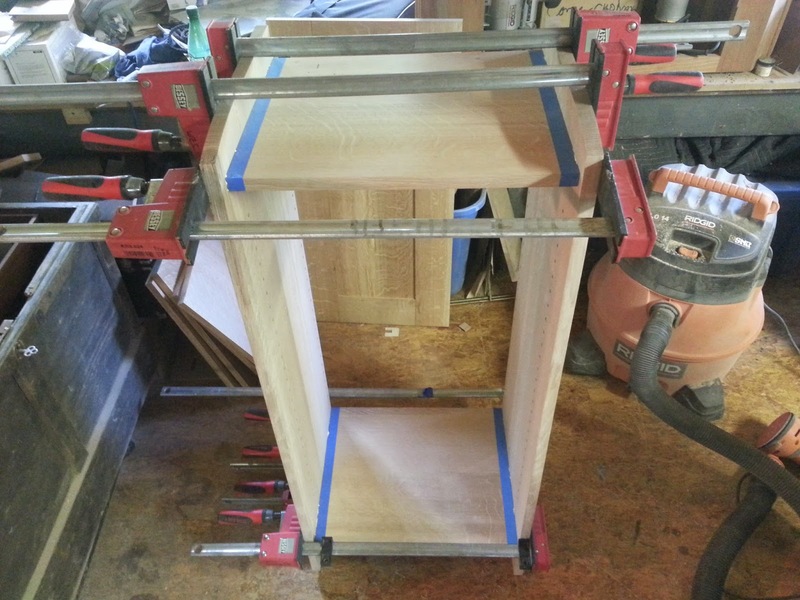 Once the template was completed , I attached it to a side panel, rough cut the required profiles with a jig saw, and cleaned the profiles up with a router and a flush cut bit. 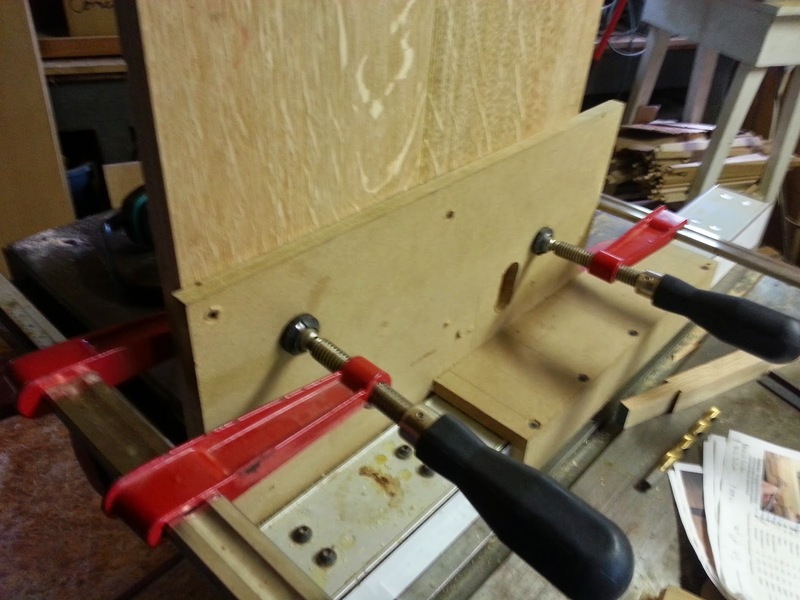 While the template was still attached, I cut the mortises using a smaller flush cut bit on a second router, In each instance, the template served as a guide, and the router created an exact duplicate of the shape I needed. 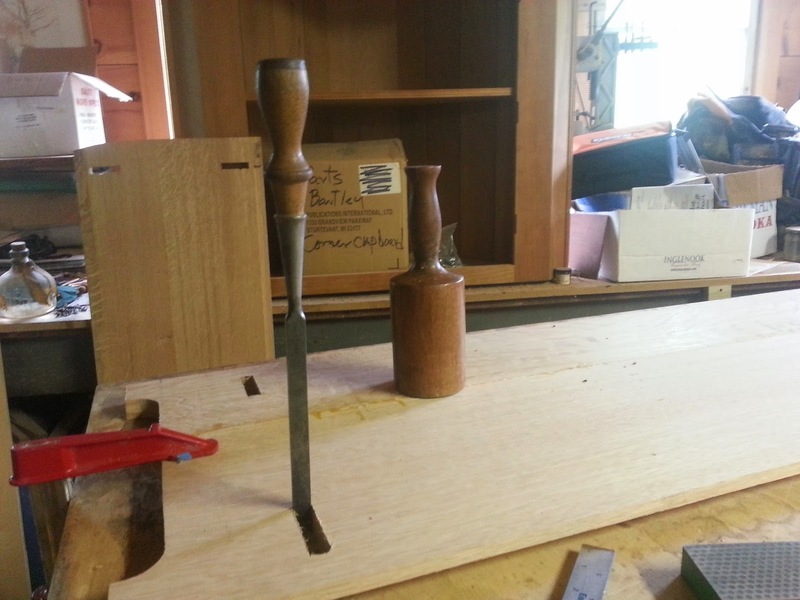 After the routing was done, the corners of the mortises were squared off with a chisel as seen below. 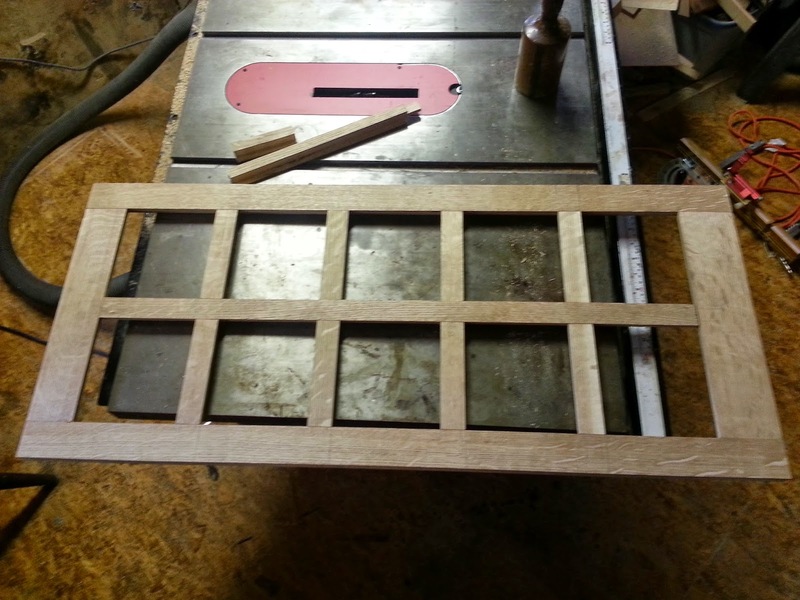 The next step was to create the through tenons that would join the top and bottom panel to the side panels. 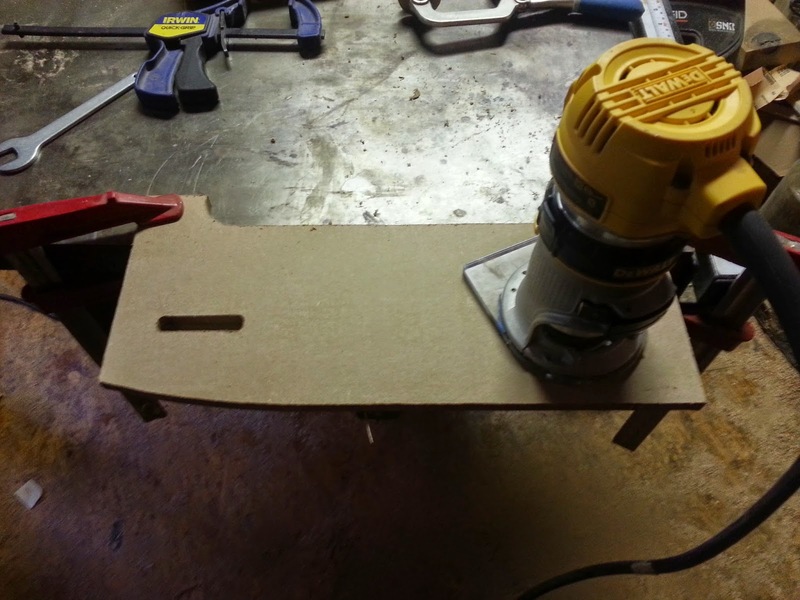 I did this using a trick I learned from another project, which was to use a dado stack installed in the table saw, but replace the stacking blades in the center with a MDF shim 1/2" in thickness. This basically converts the stack into two blades on the saw running simultaneously and parallel to each other and the fence. 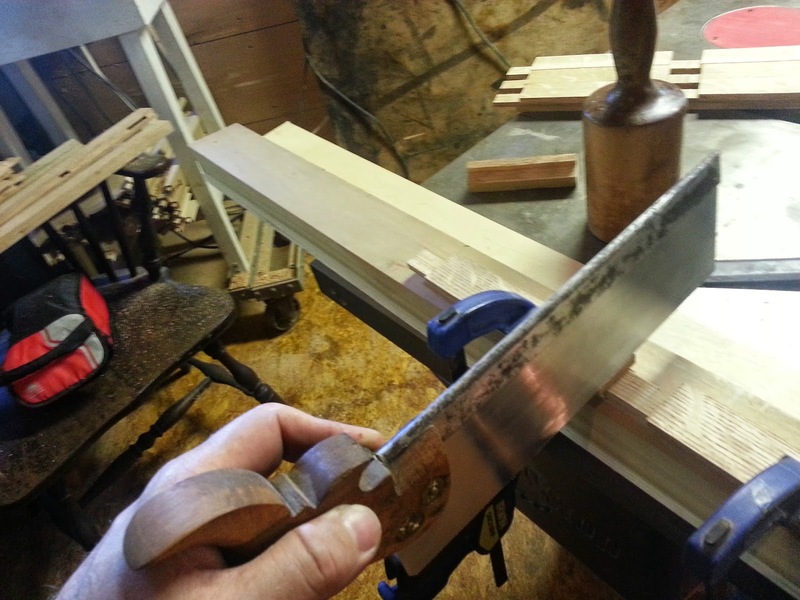 Using a sled on the fence, I passed the top and bottom panel over the blades, which cut the shoulders of the tenons. 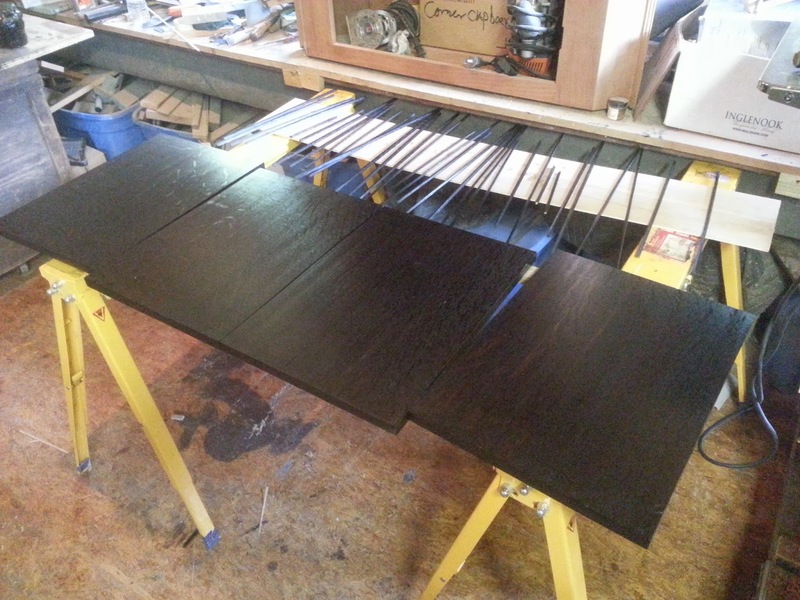 They were all aligned and the proper thickness and all of the long shoulders cut when completed. Below are a few photos of that process. 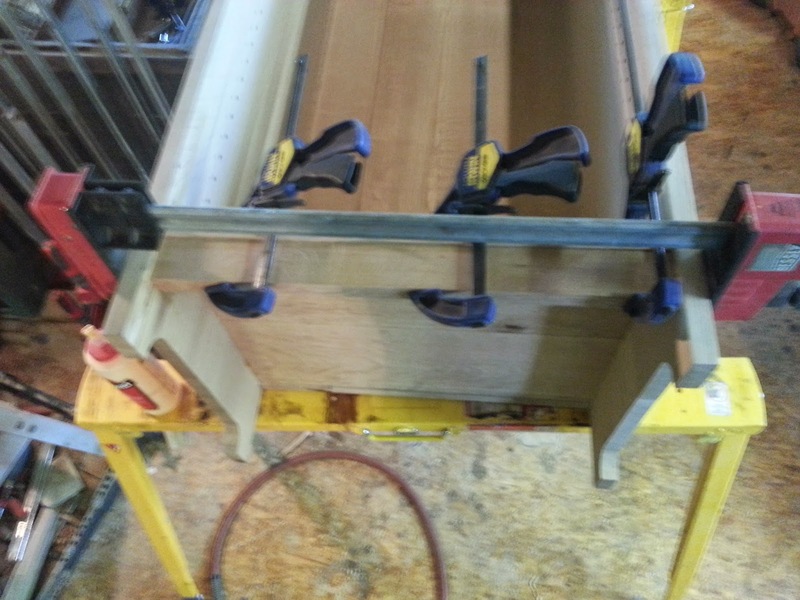 After the shoulders were cut I used a jig saw,a router, and finally a hand saw to cut away the unnecessary parts of the wood, leaving two tenons on either edge of the top and bottom panels. The last step before dry assembling the case was to create a stopped rabbit on the back edge of the side panels to receive the back panel. After I had finished this I assembled the side panels, top and bottom dry to take measurements to construct the back panel. 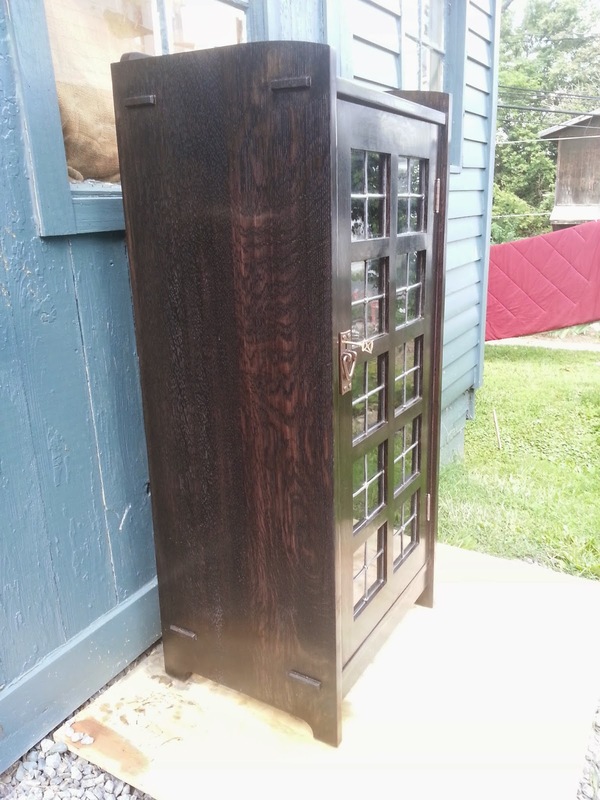 The back panel is composed of rails and stiles that frame a center floating panel. The joinery included what is known as a haunched tenon, that from the outside looks short, but on the interior plunges deep into the stile to give good strength to the panel. 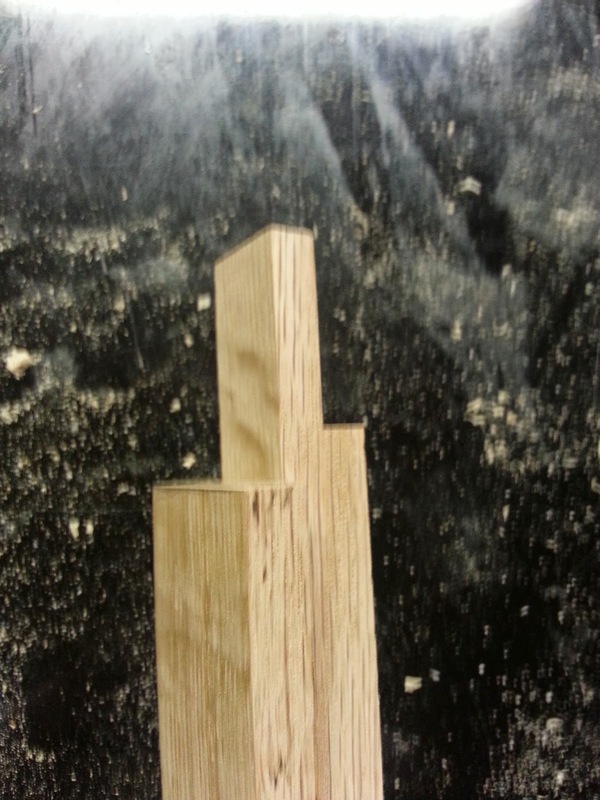 Below is a photo of that tenon. 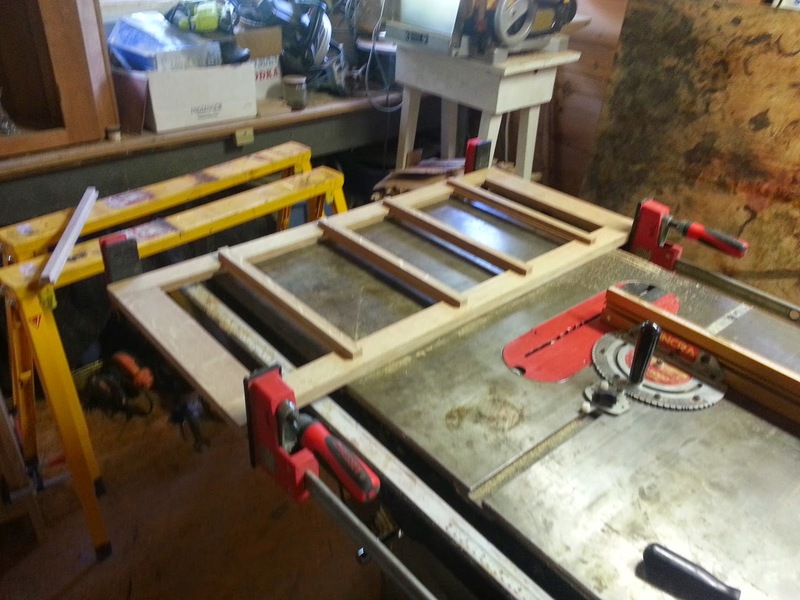 This photo shows the frame and panel being glued up. Once the panel was glued, I fit it to the back of the assembled case as seen in the photos below. 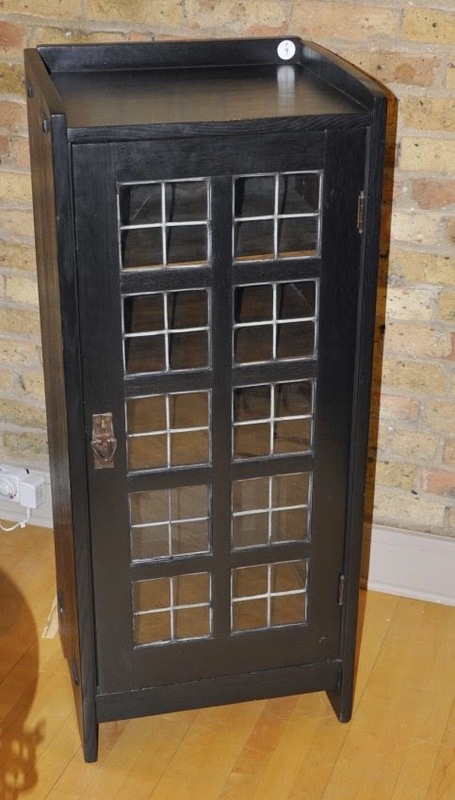 As hinted at earlier, Robert Lang used mitered lap joinery to join the mullion (vertical divider) with the muntins (horizontal dividers) on the door. 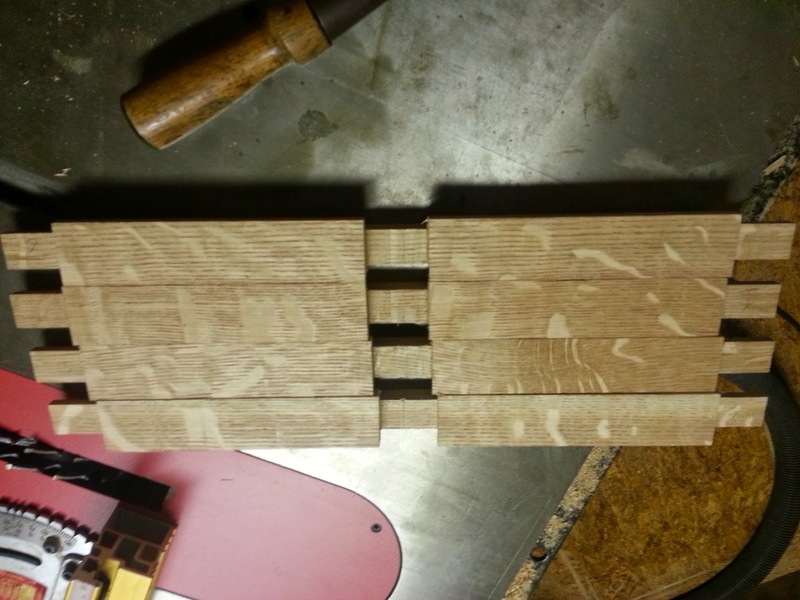 I decided to go with a straight lap joint at these intersections, which was how the piece my customer presented to me was constructed. 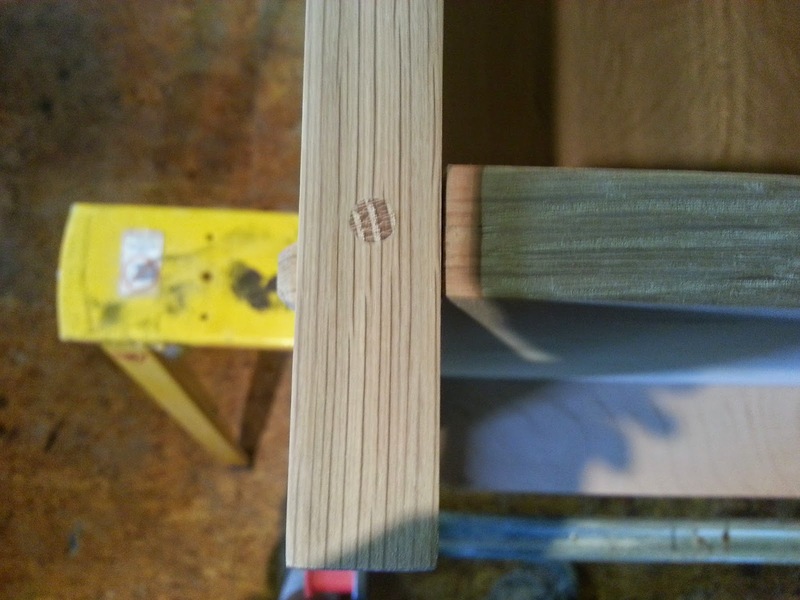 While the mitered joinery would have proved an interesting challenge, standard lap joints were challenging enough! 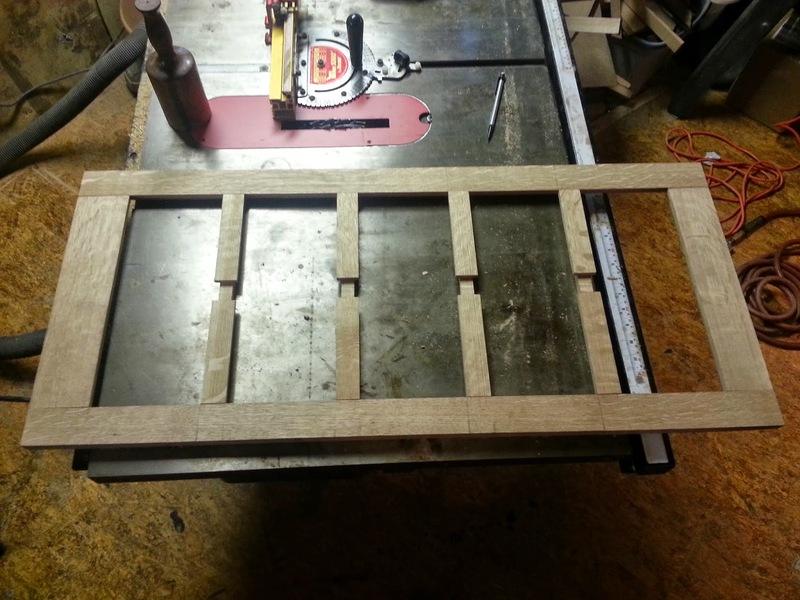 After constructing the outer frame of door I figured out the spacing of the muntins and cut the tenons on the end of each board. 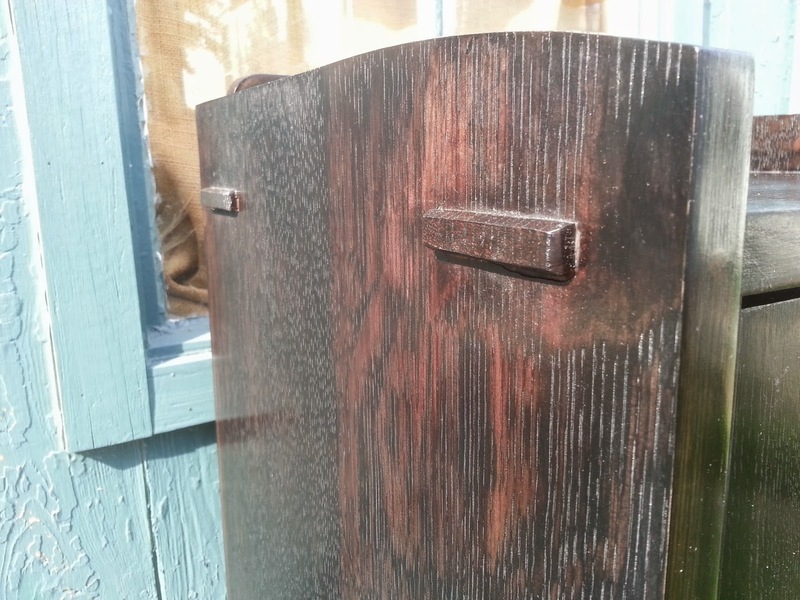 Because the inner edge of the door frame was rabbeted to receive the glass panel, the tenons on the muntins and mullions all had to have uneven shoulders as seen below. 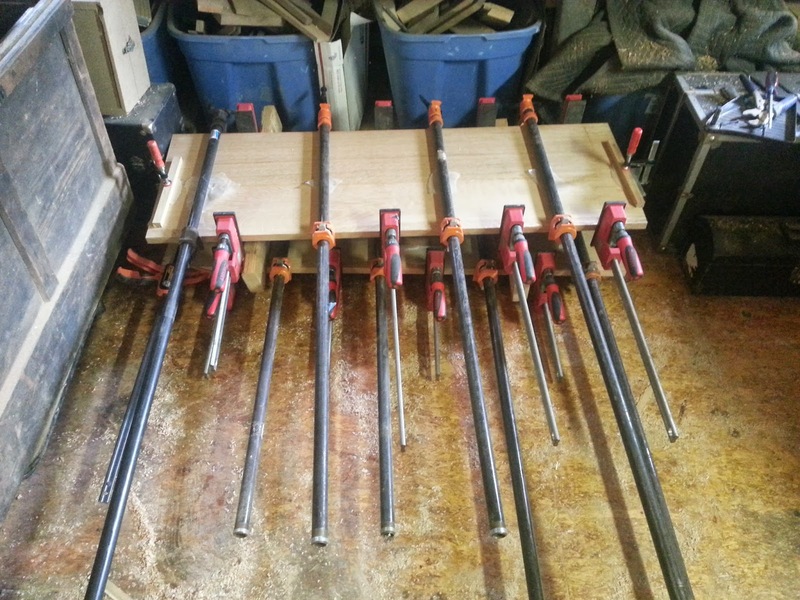 This next photo shows all of the tenons cut on the four muntins and the one mullion. 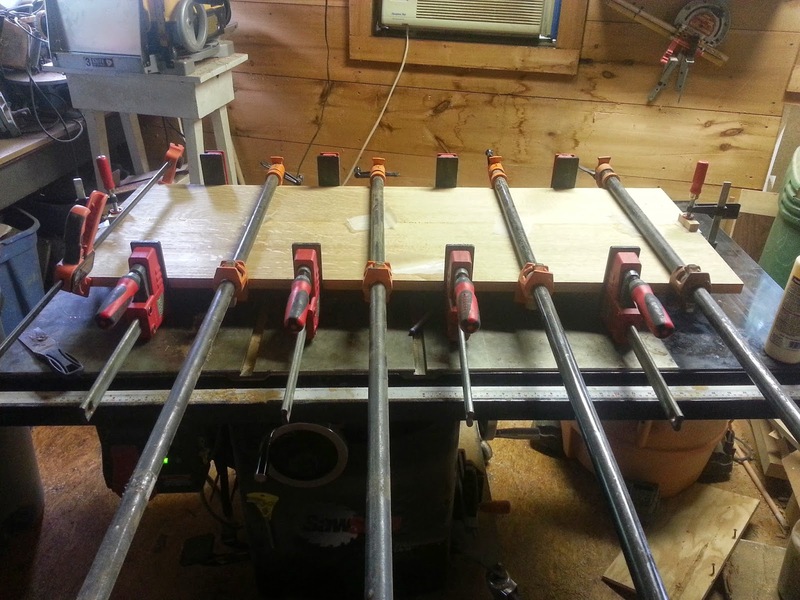 The next step was to cut the mortises for these tenons. 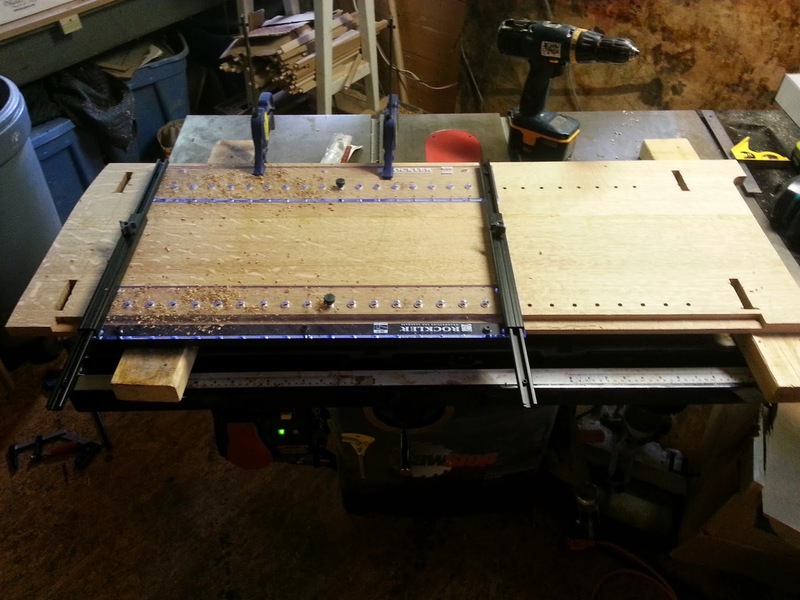 I decided to install the vertical mullion first since it overlapped the muntins. This would make layout easier on the muntins. Here I have removed the mullion and am installing the muntins. 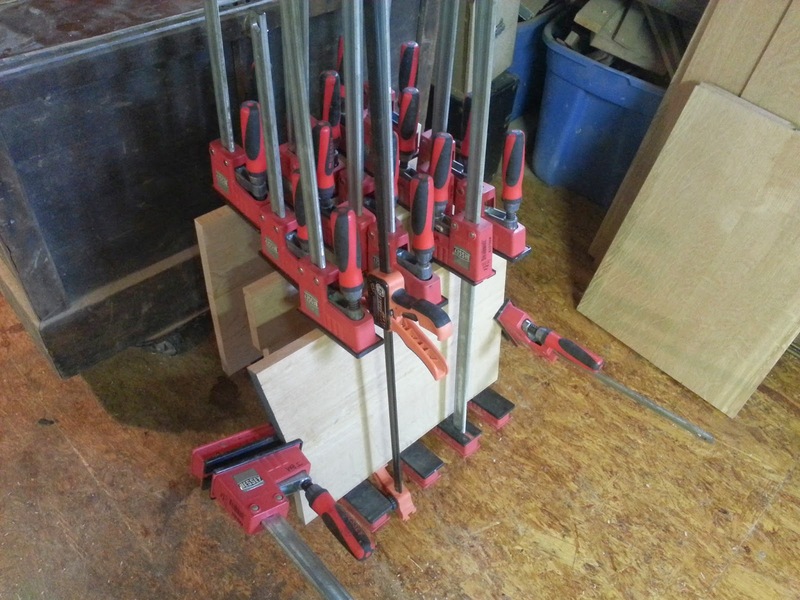 Once all of the tenons had corresponding mortises, I needed to create the lap joint where all of the dividers intersected. I first laid the muntins face to face with the mullion and scribed the edges where they intersect. 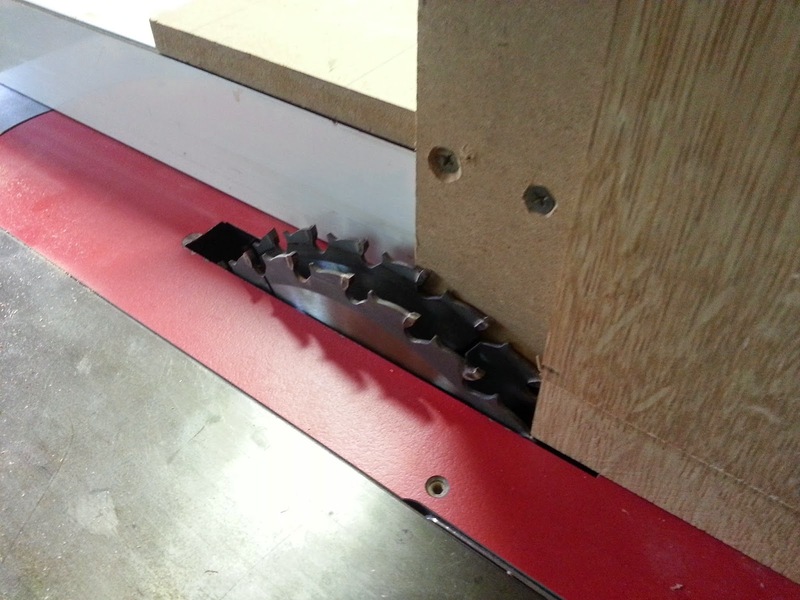 I then used a dado stack on the table saw to remove most of the waste. Cutting to the exact line was achieved using a chisel and a hand saw as seen below. 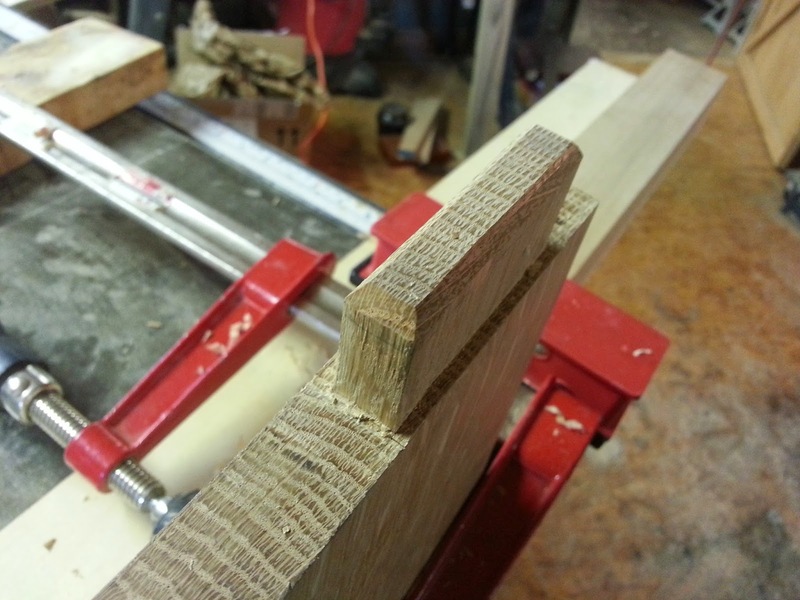 Once in place I was able to scribe and cut the corresponding joinery on the mullion. 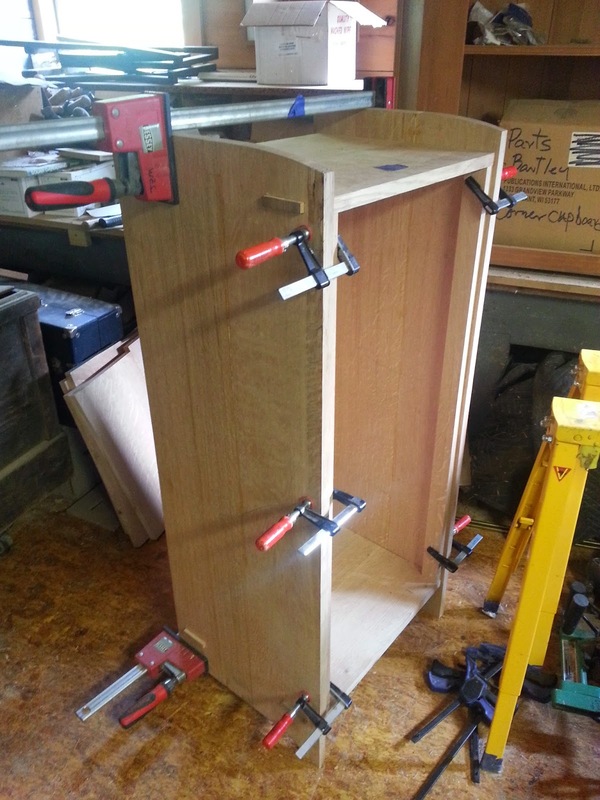 As the door was clamped and drying I went back to the case to make final changes to the case and glue it up. 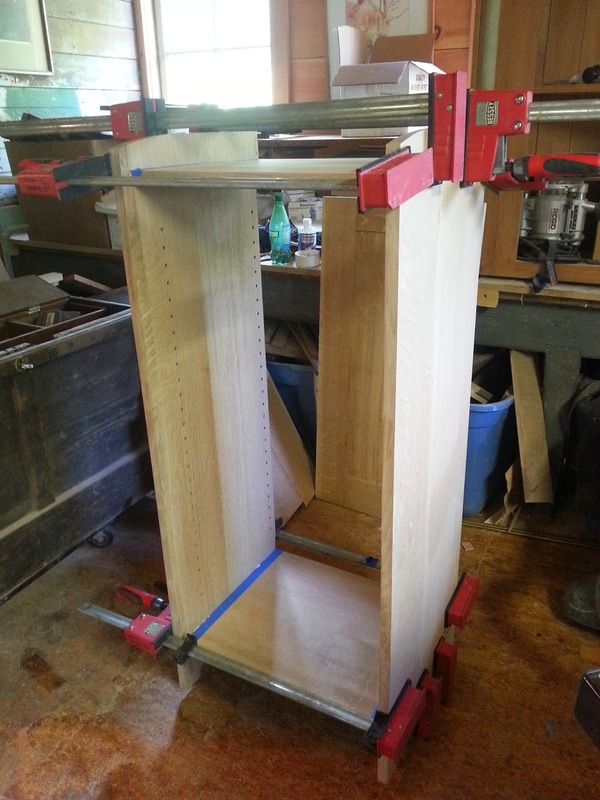 The first step was to drill the holes for the adjustable shelves. 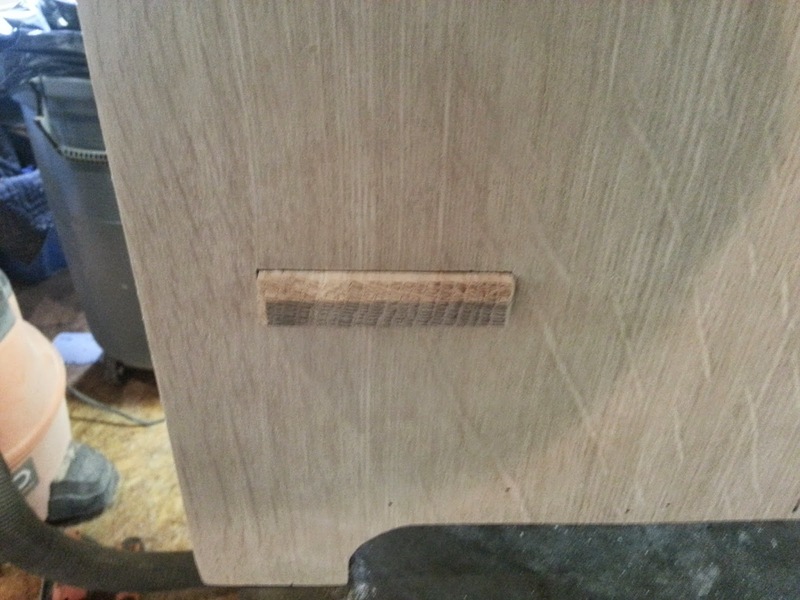 The alignment of these holes was aided by a jig sold by Rockler hardware as seen in the photo below. 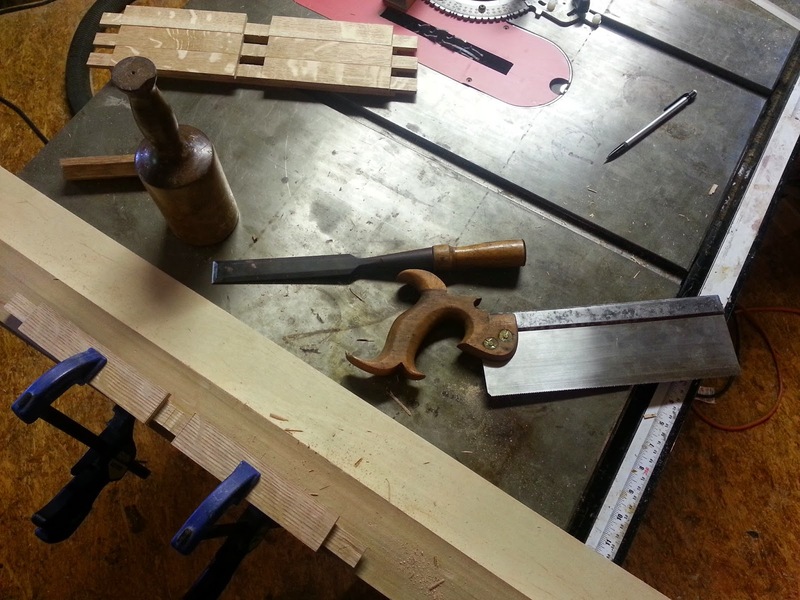 Another detail was the chamfering of the edges on the through tenons. 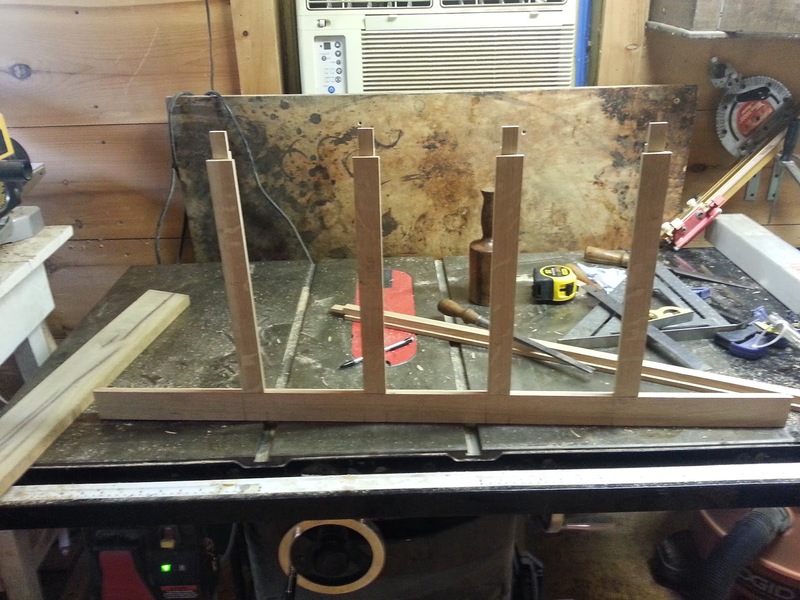 While the case had been test fit, I drew a line where the case met the edge of the tenons. 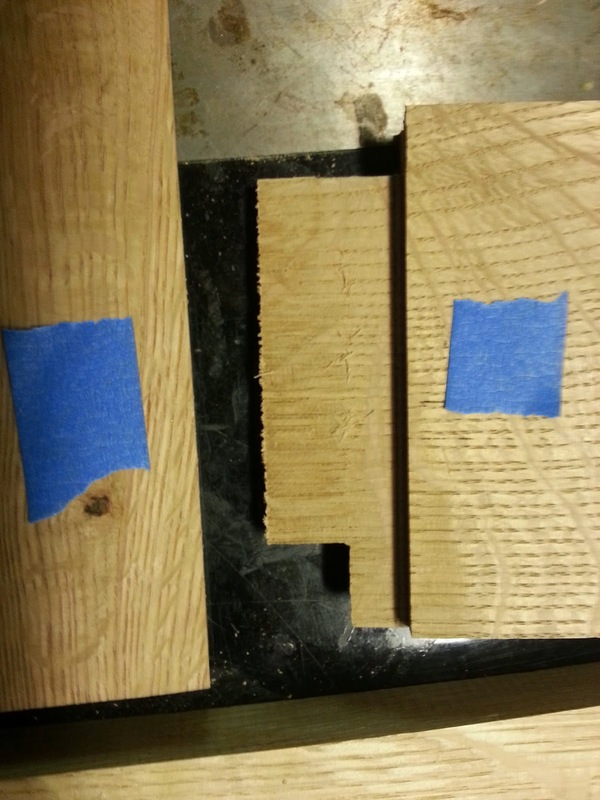 Once removed, I measured off of that line and split the difference from the outer end of the tenon and cut the beveled edge, as seen in the photos below. These next two photos show the case being glued. The blue tape helped with cleaning up glue squeeze out. This shot shows the completed tenon. After the case had dried, I pegged the four intersecting corners on the front of the case. These pegs were later cut off flush with the case. 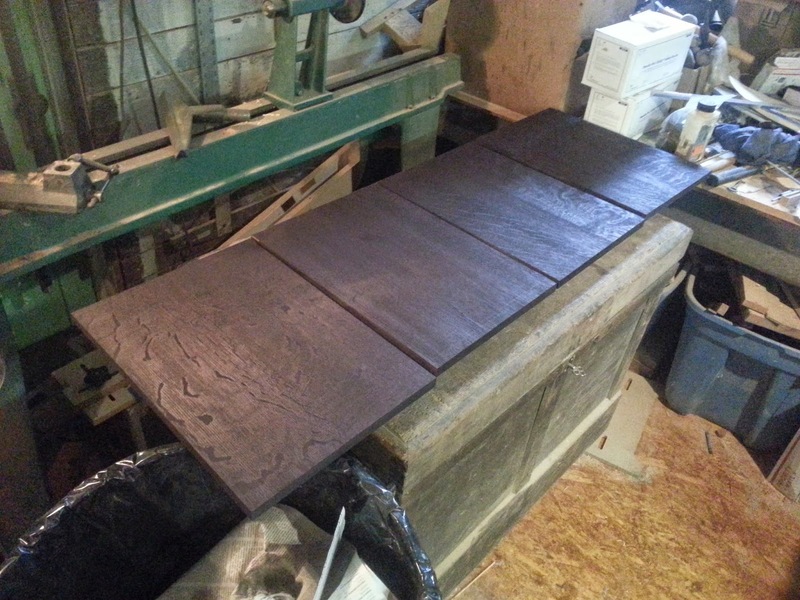 These next two photos show the back splash and kick board being glued in place. 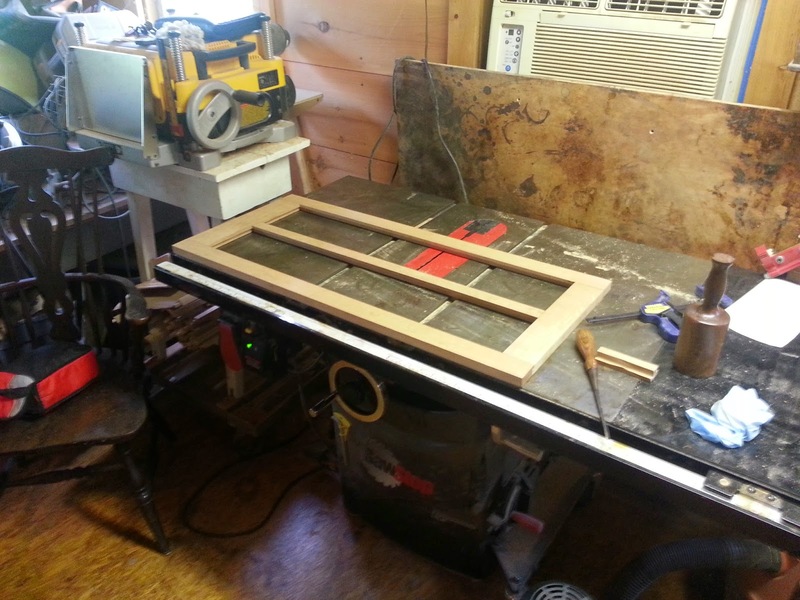 The panels were comprised of four small glass panes taken form old window glass. This glass was selected because of the waves and bubbles that are found in old glass. 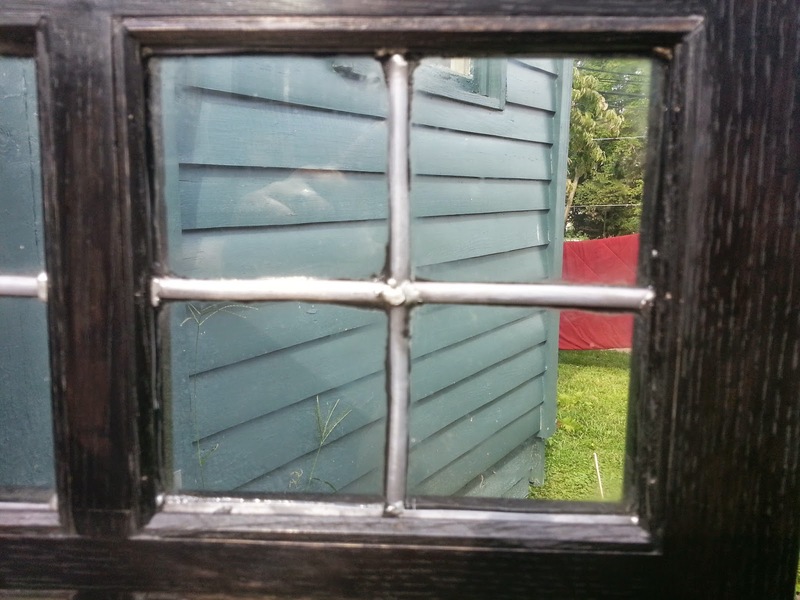 The panes were held in place by a frame made from lead came used to make stained glass panels. 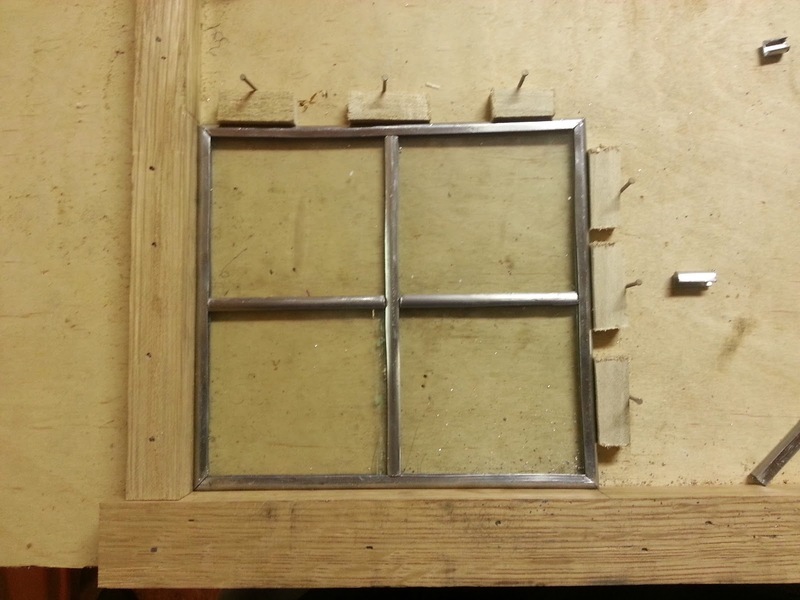 Once the individual panes were cut I cut the frame of lead to fit around them. 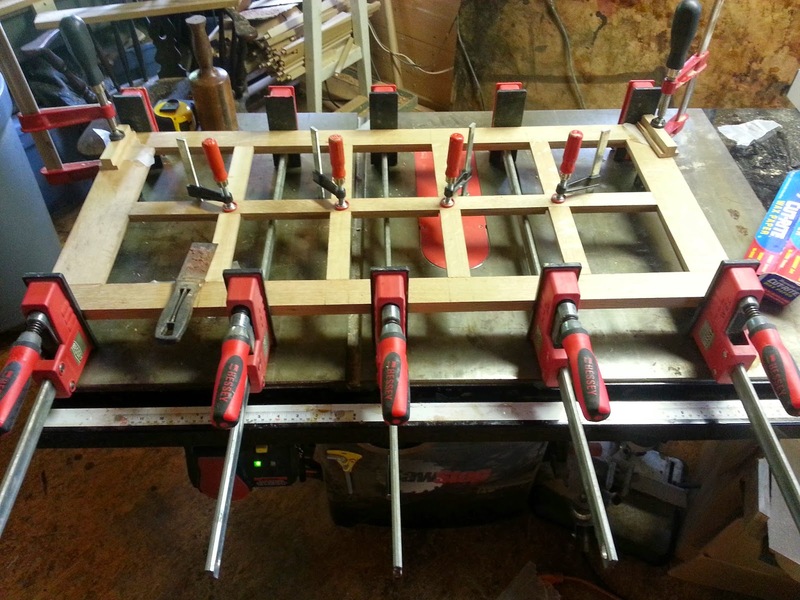 I then tacked the assembled frame in place on a board while I soldered the joints. 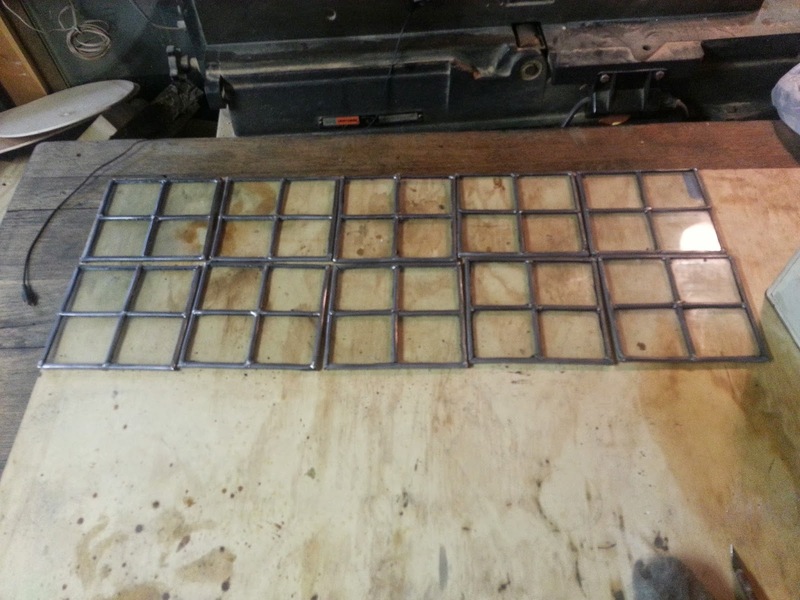 Below is a photo of one of the assembled panels ready for soldering. After the panels were soldered I used stained glass cement to tighten up the panes and when finished, I had ten panels ready to install. 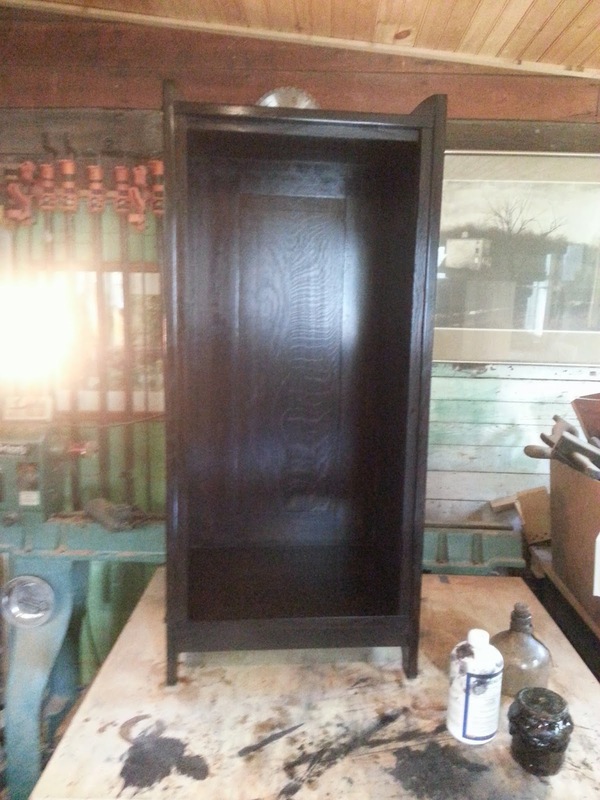 The stain I used for the cabinet was Jet Black ultra penetrating stain. I put it on pretty liberally , but not so much as to completely obscure the wood. 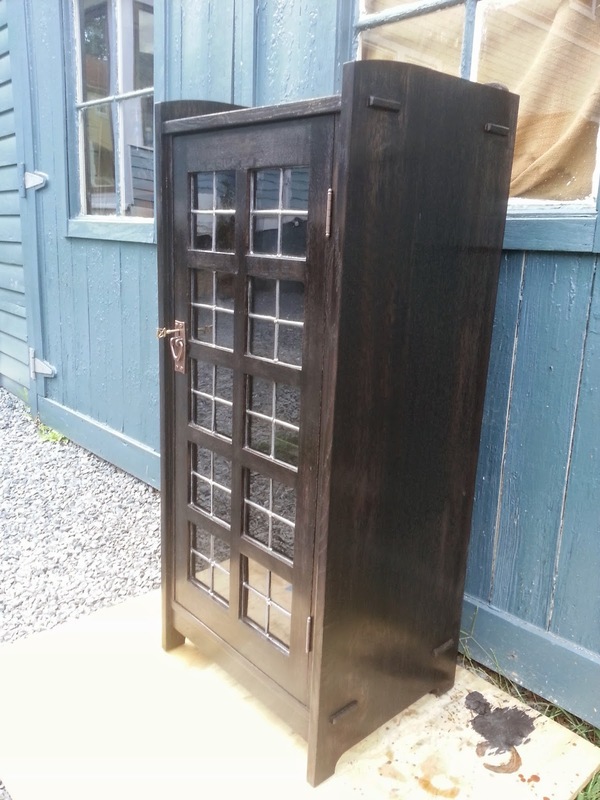 The result was that the brown tones of the oak beneath came through and gave the case a very dark brown appearance. 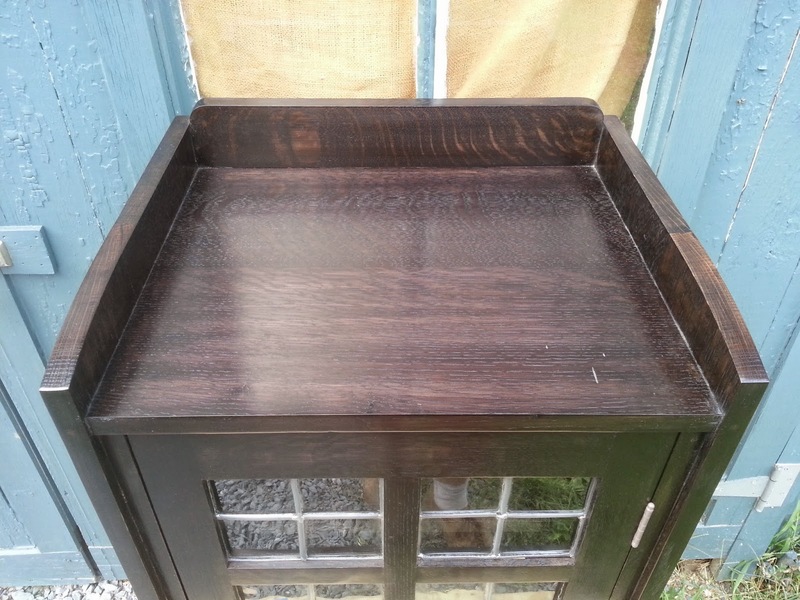 After the stain had dried, I applied a shellac finish. 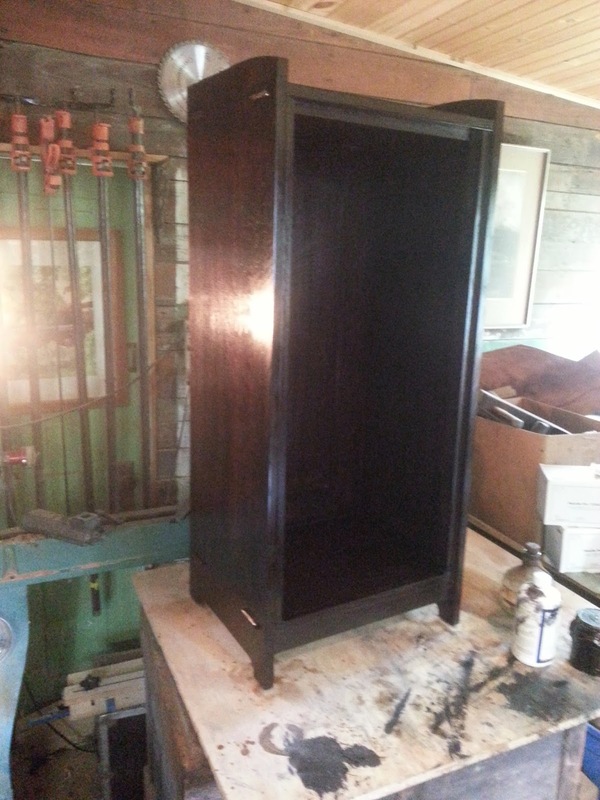 Because of the streaky nature of paste wax, I did not use it on this cabinet, but instead rubbed the finish with a buffers polish as a final treatment. 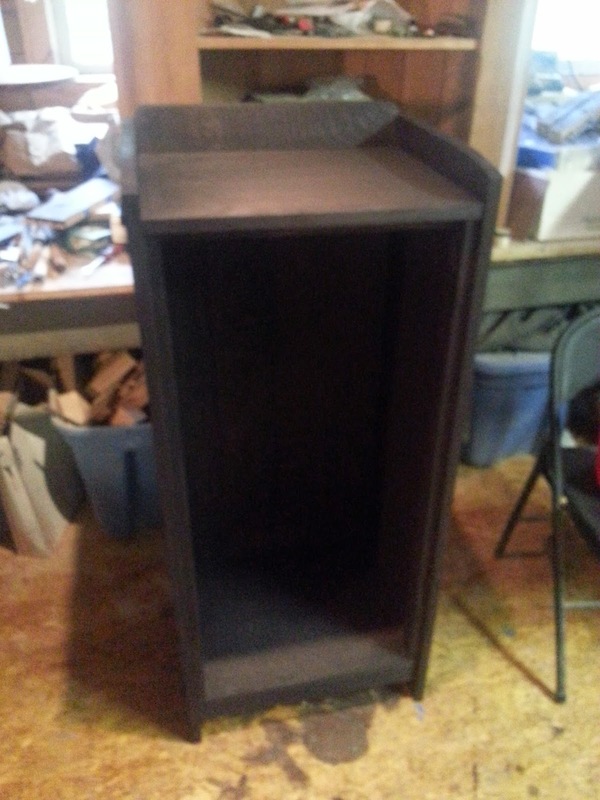 These next photos show the case during the finishing process. 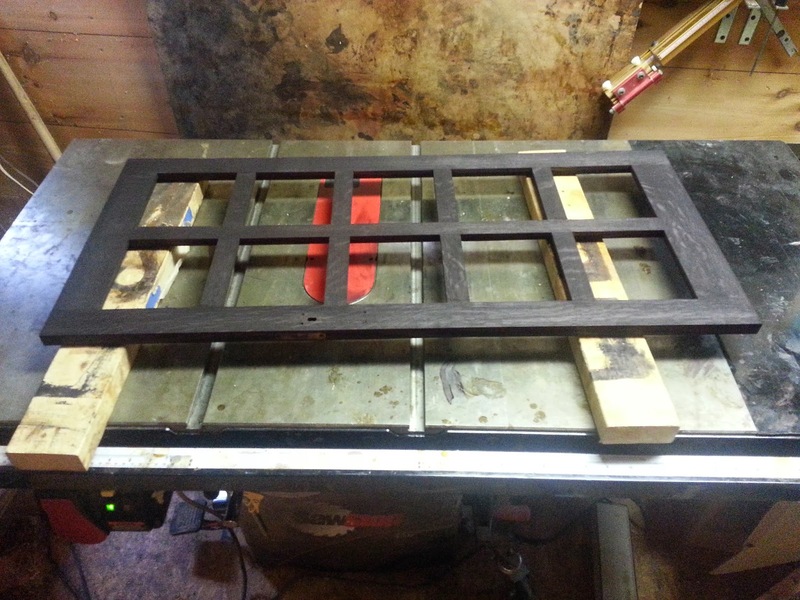 The little strips seen in this photo are the pieces used to hold the glass panels in place. They were later cut to fit when the glass was installed. 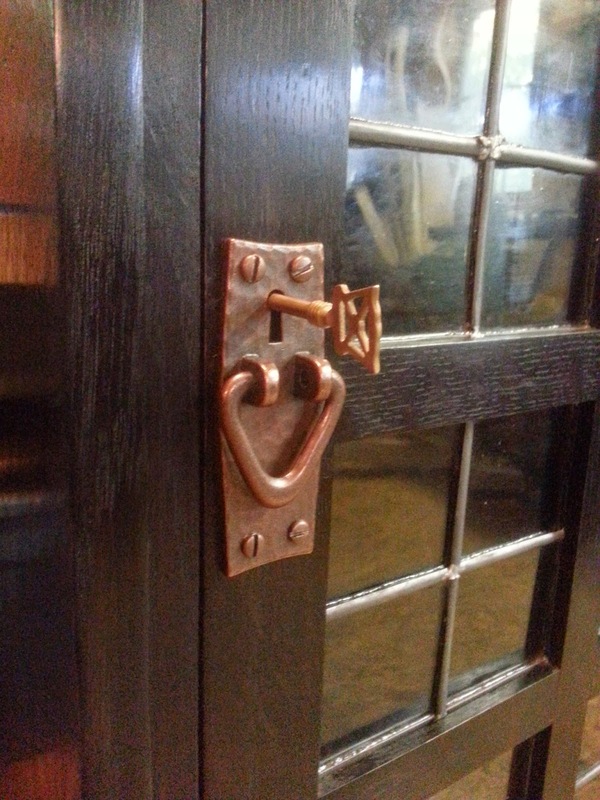 The hardware was a traditional Stickley style "V" pull handle with an escutcheon. Another piece the customer had used the brass key seen below. I am not sure if that is an original Stickley key or not, but I found one on Ebay and I fit it to the lock. Completed, the music cabinet surrounded by the mess created by its construction! 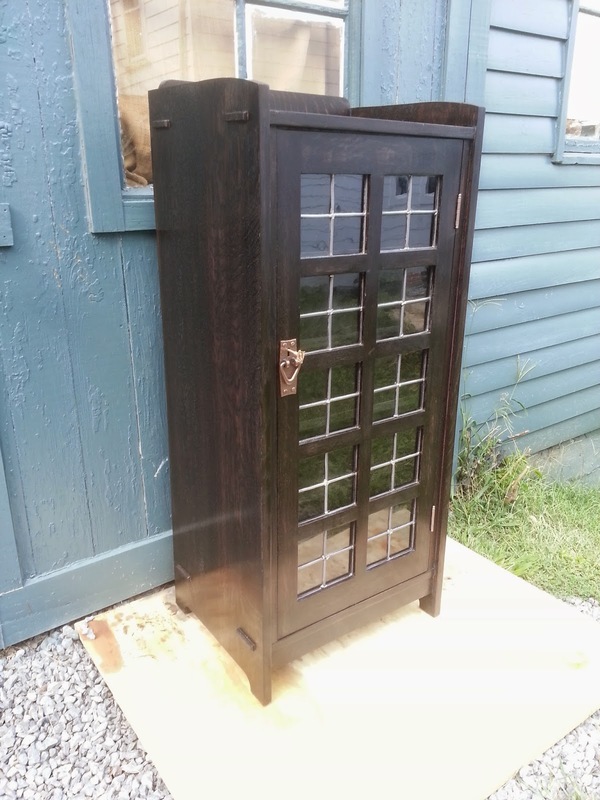 The following photos show the completed cabinet with the glass panels installed and hardware in place. I have found that when I get the opportunity to build a reproduction, that I really enjoy it. 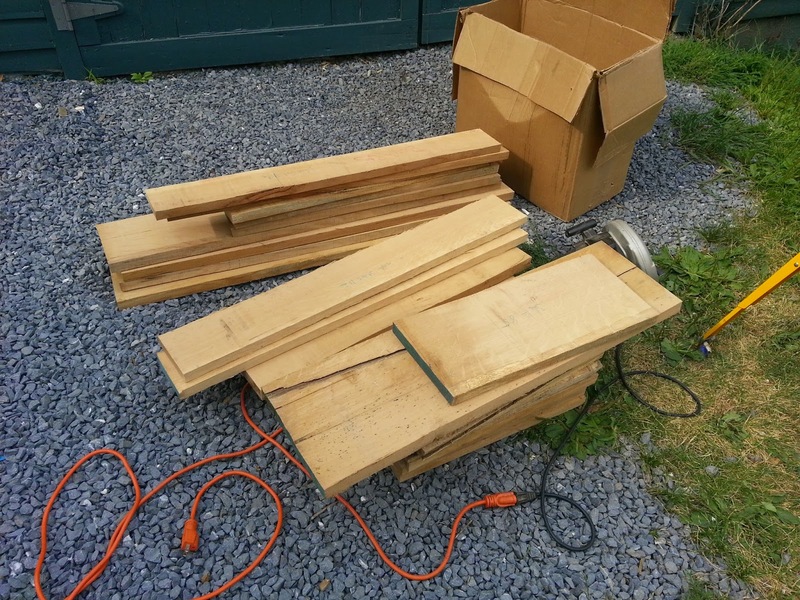 Likewise, when I get the chance to build with oak, I find the process very satisfying. This project combined the two and was very rewarding for me and I would jump at the chance to do it again! That came out great. How deep were the lap joints in the door mullions and muntins? Were they true half laps, or is one side a shallower cut? 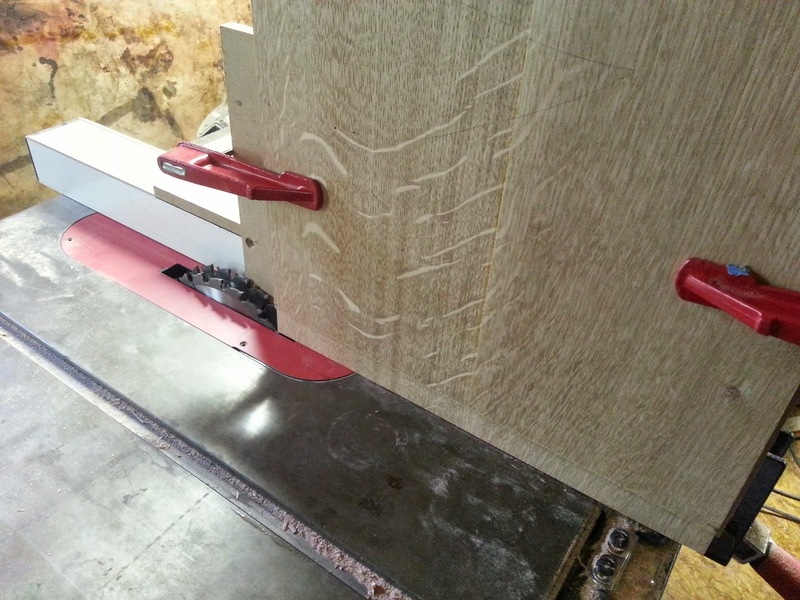 P.S TedsWoodworking has fast become the most popular woodworking package. The sale price will not last forever. If you are looking for best blueprints, illustrations and plans to make any project easy and hassle-free, than I urge you to get in while its cheap. 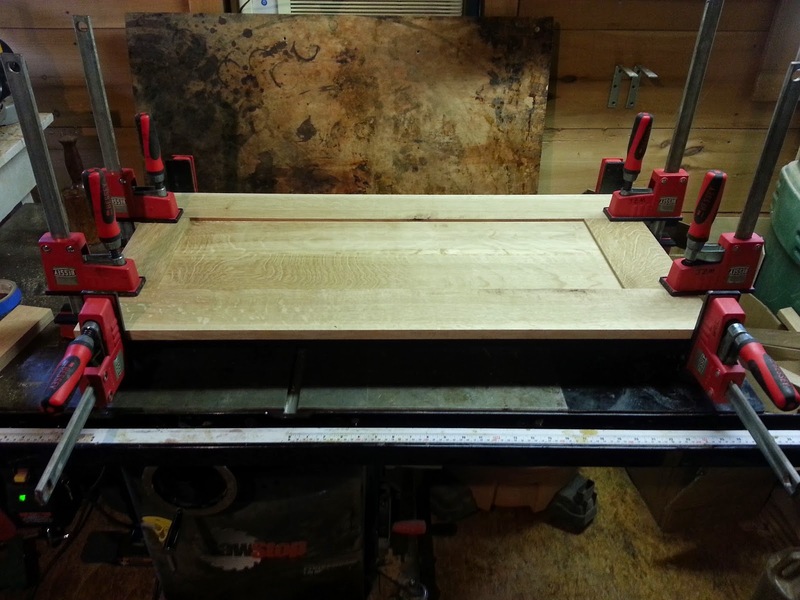 Get instant access to 16,000 woodworking sketches. 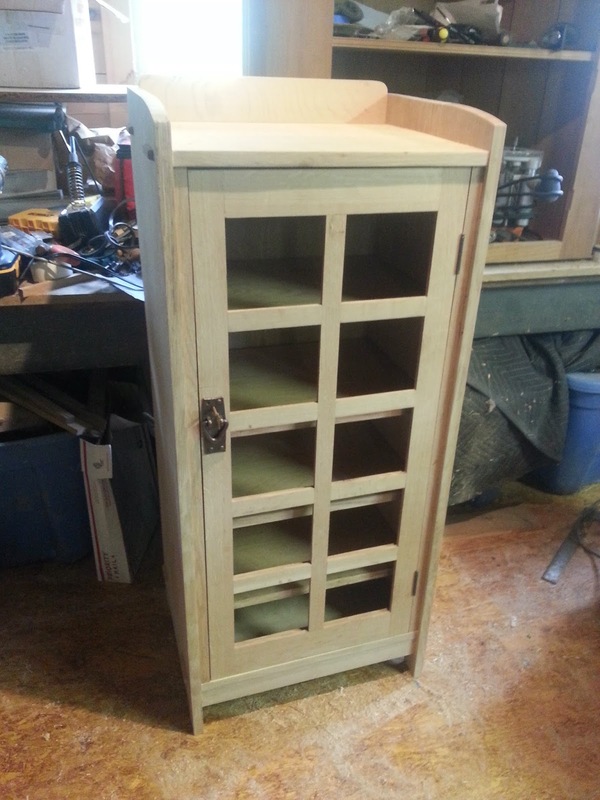 Teds Woodworking has more than 16,000 woodworking plans with STEP BY STEP instructions, sketches and diagrams to make each project smooth and easy!! !